The pleasure of a moisturizing lotion with energizing benefits. Enriched with soothing organic aloe vera and shea butter, spicy zesty coriander essential oil and colorful, vibrant Mango extracts, this body lotion leaves the skin energized and moisturized. Botanical-based ingredients: Organic and fair trade Shea butter, Aloe vera gel from Organic Farming, Coriander essential oil (in the fragrance) and a Mango extract. Explore the entire range of Lotions & Creams available on Nykaa. 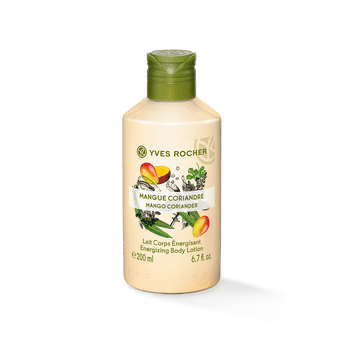 Shop more Yves Rocher products here.You can browse through the complete world of Yves Rocher Lotions & Creams .Alternatively, you can also find many more products from the Yves Rocher Energizing Body Lotion - Mango Coriander range.